If you like sausage, and kraut, you will love this combination all in one meal. Kraut takes a while to cook in a regular pot, but with a pressure cooker your meal will be ready in 15 minutes. 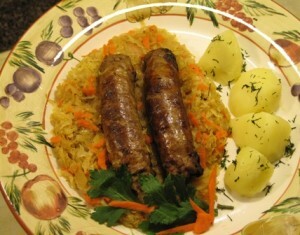 My family enjoys this meal served with boiled potatoes, tossed with butter and dill. Heat the oil in the pressure cooker. Separate sausage links, rinse, and pat dry with paper towel. Brown sausage links in hot oil until golden on both sides. Add chopped onions to the cooker, saute 2 minutes, and remove into a large bowl. Place the kraut in a colander, and rinse under running water for a minute (do not rinse out too much of the brine). Squeeze out excess water from the kraut. Add shredded carrot, celery seeds, salt and pepper. Mix all to blend well. Place the steamer basket in the pressure cooker. Place the kraut in the basket, and top off with the sausage. Secure the lid per manufacturer’s instructions. Set your alarm at 15 minutes, once the steam begins to escape. Cool off the cooker immediately under a slow stream of running cold water, down one edge of the lid and side of the cooker. Remove the lid per manufacturer’s instructions. Remove the sausage and set aside. Remove the kraut into a serving dish and mix with the remaining broth in the cooker. Serve with boiled potatoes, seasoned with salt, pepper, melted butter and dill. I made this for dinner last night. It was a great weeknight meal – fast, easy, and tasty. The kraut is SO tender when cooked in a pressure cooker and the carrots and onion give great flavor and neutralize the natural saltiness of the kraut. I served this with small, skin-on,boiled red potatoes as a no-fuss side-dish. Isn’t it great how little time it takes to prepare a whole meal, and save energy at the same time. If you like kabasy (smoked sausage), especially one made at a Polish or Ukrainian butcher shop, and substitute it in place of the Italian sausage, you will really love it. In the future I will post some of those butcher shops I am familiar with, so keep on reading my posts.